As an animation house, Dreamworks tends to rely heavily on a wash, rinse and repeat formula for its family entertainment, mixing light-weight storytelling with A-list star power and shallow pop culture references. Occasionally, the formula works, as in Shrek or Kung Fu Panda. More often than not, though, the results are instantly forgettable and, in the worst cases (Shark Tale, anyone? ), grating. No wonder How to Train Your Dragon was such an abashed joy: it was the rare entry in their catalogue to focus on heart, imagination and storytelling over exhausted market-tested gimmickry. 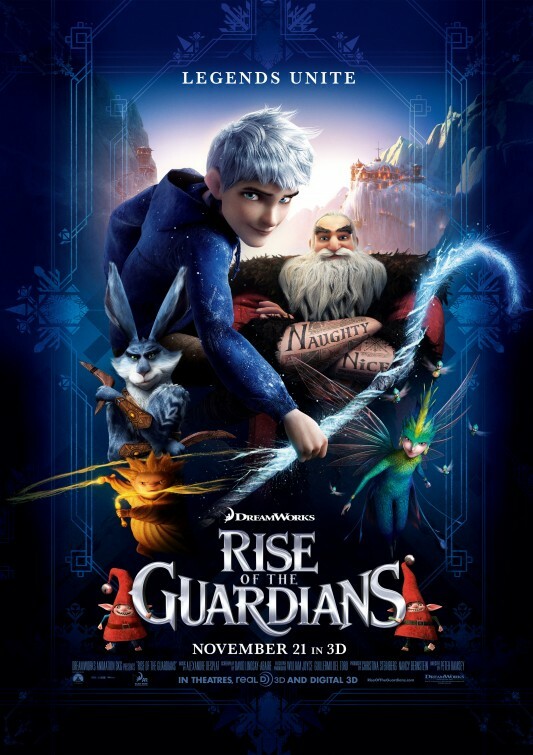 While their latest, the generically titled Rise of the Guardians (No, the owls of Ga’Hoole do not cameo), never soars to the breathtaking heights of the exhilaratingly loveable Dragon, it nonetheless makes broad, colourful strides in the right direction. 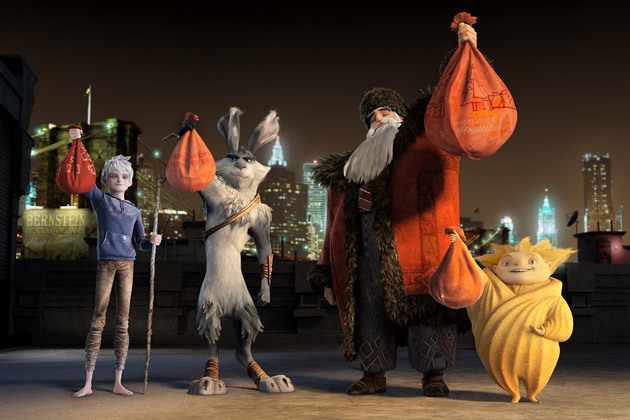 Based on William Joyce’s "The Guardians of Childhood" book series, Rise boasts a premise that is ingenious in its kid-pleasing appeal: Santa Claus (called North and played by Alec Baldwin), the Easter Bunny (Hugh Jackman – a cheeky highlight in rugby hooligan mode), Sandman and the Tooth Fairy (Isla Fisher) are a top secret super-team responsible for protecting Earth’s ankle biters. Their greatest foe? Pitch Black (slyly silky Jude Law), better known as the Boogieman, who seeks to weaken the Guardians’ powers by polluting children’s sleep with nightmares. Once Pitch’s threat is recognized by Guardian head honcho The Man in the Moon, he inducts Jack Frost (Chris Pine) into the group. Resembling a sullen My Chemical Romance fan in his form-fitting blue hoodie and skinny jeans, the reluctant silver-maned Jack longs only for friendship and the recovery of his lost memories of creation. Of course, in order for him to complete his Hero’s Journey and defeat Pitch Black, he must discover the importance of teamwork and, more importantly, his own importance in the fanciful minds of young believers everywhere. Although the film was directed by longtime storyboard artist Peter Ramsey, executive director Guillermo del Toro’s (Pan’s Labyrinth) darkly quirky presence that looms largest over the film. Rise of the Guardians is a lush visual feast of stunning unusual settings, from North’s Yeti-run toyshop (the dim-witted elves basically just take up space) to Bunny’s Easter Island-like fantasy land of mobile stone eggs and vibrant rivers of decorative dye. Real attention has also been paid to making these established characters feel new. The filmmakers have a lot of fun putting their own spin on seemingly familiar sights, such as the tattooed North’s gravity-defying sled, Tooth Fairy’s cute diminutive helpers and the trails of ornate ice emanating from Frost’s magical staff. The mute Sandman – who speaks in pictographs – proves the greatest spectacle, however, in a climactic sequence that’s utterly breathtaking. If only the script, by David Lindsay-Abaire (Robots, Rabbit Hole), was as stellar as the sumptuous 3D imagery. After a gorgeously haunting opening introducing Jack, Rise of the Guardians sort of pleasantly plods along, from action beat to action beat, before finding its rhythm around the hour mark. Yet, once the gears have lined up, and the central message regarding the significance of belief and wonder kicks in, the weighty emotions are so warmly communicated that it’s easy to forgive the narrative shortcomings. A few more polishes and this might have been a great movie, as opposed to just a really good one. Ultimately, this film and its heartfelt themes should play like gangbusters to both its target audience – who will be swept up by the beloved iconic leads and clever eye candy – and their nostalgic parents. 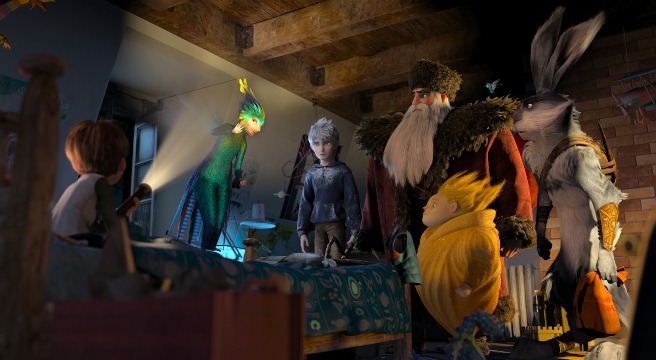 Rise of the Guardians may not belong among the best modern animated motion pictures, but its touching, dazzling and dynamic. There’s purity to its intentions and, when it comes to family fare, sometimes that’s the most desirable gift you can hope for.